Augustine Mano is the Managing Director of the Mineral Resource Development Corporation. In this role he is responsible for the management of the landowner equity interests in mining and petroleum projects, valued at over K1oo million . Augustine Mano also has his own extensive network of corporate interests. According to Investment Promotion Authority records, in June 2015, that network was extended when Mano spent K6.5 million to buy a 50% stake in the company Civil Contractors Pacific Limited. The company is often referred to as CIVPAC. Mano purchased the shares in CIVPAC through his wholly owned company, SMA Investments Limited, although documents filed with the Investment Promotion Authority suggest Mano originally intended to make the purchase using an off-shore company registered in Hong Kong. 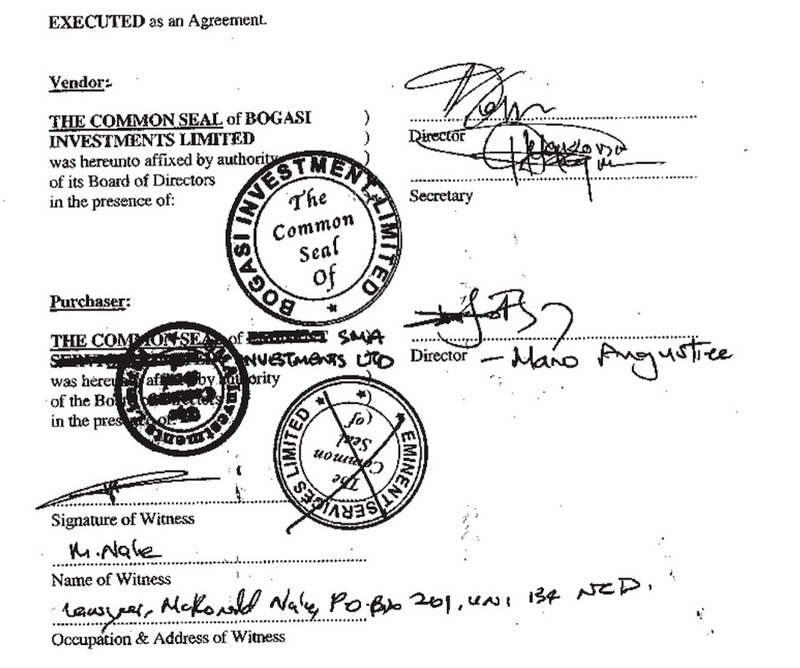 The contract, prepared by Jema Lawyers, for the purchase of the shares in CIVPAC shows the vendor as Bogasi Investments and the original intended purchaser as Eminent Services Limited. The purchase was supposed to be completed in July 2014. Eminent Services Limited is a Papua New Guinea registered company with one shareholder, EMS-Eminent, a Hong Kong registered company with its registered address at Level 54, Hopewell Center, Queens Road East, Hong Kong. However, the sale of CIVPAC shares to Eminent Services was never completed, despite the company seal appearing on the sales contract. Instead, 12 months after the original intended sale, the contract documents were amended with the name Eminent Services being crossed out and SMA Investments written in (as shown in the image below). The contract was signed by Augustine Mano as the Director of SMA Investments. But this was not a simple case of one sale falling through and another purchaser being found as Augustine Mano is not only the owner of SMA Investments, he is also heavily connected to Eminent Services Limited, the first intended buyer. Augustine Mano is the only registered Director of Eminent Services, is listed as the company Secretary and is the person who applied to register the company in May 2014 (as shown in the image below). The company registration application for Eminent Services was filed in by Jema Lawyers, the same lawyers who handled the purchase of the CIVPAC share by SMA. Although the owner of Eminent Services is listed as EMS-Eminent Limited of Hong Kong, there does not appear to be an EMS-Eminent registered in Hong Kong. However, investigations in Hong Kong have revealed there is an Eminent Services Limited registered there, with an address at Level 54, Hopewell Center, Queens Road East (the same address as is given for EMS-Eminent in the company records for Eminent Services Limited). An Augustine Mano from Port Moresby is listed as sole shareholder and sole director of the Hong Kong registered Eminent Services Limited. It is not known why Augustine Mano originally wanted to use an offshore company to buy his stake in CIVPAC or why he later dropped the idea of buying through Eminent Services and instead used SMA Investment. MRDC Annual Return for 2012 filed with the Investment Promotion Authority February 2017. Accessed on the IPA website 27 May 2017. View the corporate records for CIVPAC, SMA Investments and Eminent Services and the sales contract.